Next time you go to Ephesus (unless you haven’t been there a first time, and shame on you for that) — you’ll be able to see something new. What? See something new? In a city that was a ruin 1,300 years ago, and totally abandoned by the 16th century? Well, that’s the fantastic thing about old places. They may be buried, but they’re not dead. They’re always being renewed by the archaeologists: every single day, a place we thought we knew all about is teaching us we know next to nothing. 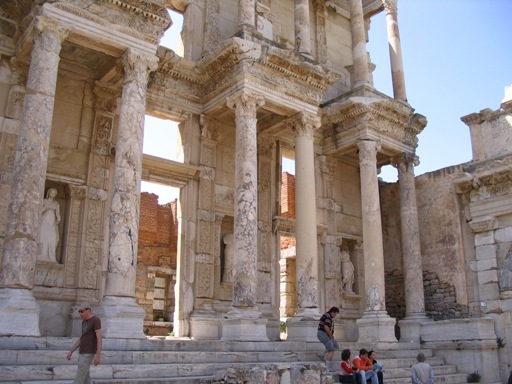 The Turkish Daily News reports that in Ephesus (one of the greatest cities of the ancient world, where the World Wonder of the Temple of Artemis once stood) they’ve found the Governors’ Palace, along with evidence that the Emperor Hadrian was the first guest there.